Based on several reports sent to us and posted in our forums, it appears that Apple has begun shipping out free bumpers to a number of iPhone 4 customers. At this time, however, the shipments appear to be limited to UK customers who ordered Apple bumpers, as opposed to third-party case options. 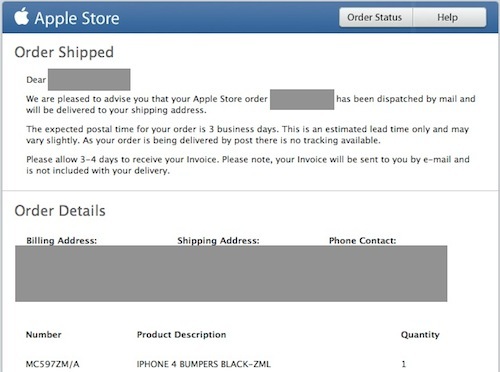 The shipments come despite initial quotes from Apple on the order of 3-5 weeks for bumper shipments. Over the past few days, Apple has also been notifying customers who purchased bumpers via credit card prior to the initiation of the free case program that their accounts have been credited. 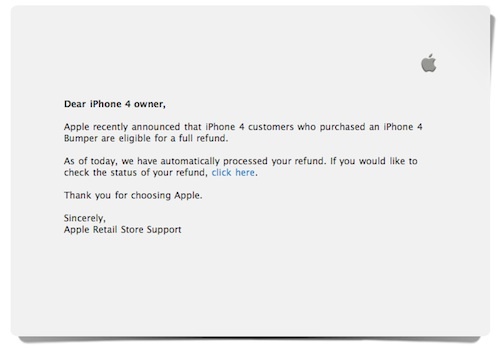 Meanwhile, customers who previously purchased bumpers via cash, check, or gift card from Apple Retail Stores have until September 30th to return to the point of purchase for a refund, while customers who ordered online using Apple gift cards should automatically receive new gift cards for the purchase amount. Finally, any customer who purchased a bumper through an AT&T retail stores is required to fill out a rebate coupon (PDF) and mail it along with their sales receipt to Apple by September 30th for processing. Update: Shipping notices for bumpers have begun spreading to a number of other countries, including the United States, with delivery times ranging out to early August, but still substantially quicker than initial quoted estimates.